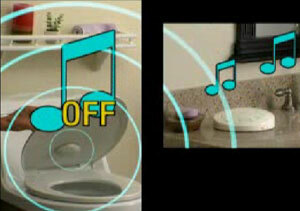 The opening scene of the Toilet Tunes infomercial is baffling. 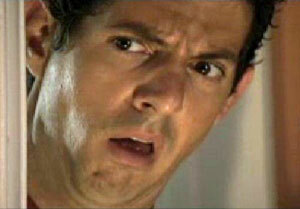 Squeezing lotion out of a bottle makes such a massive sound that it can be heard down the hall. Her date is shocked at the prospect that she might fart and/or poop in the bathroom and decides to cut the evening short. If only she had decided to attach Toilet Tunes to her toilet seat, she might have been able to hold on to such a great guyeven though Toilet Tunes wouldn’t have played at all because she wasn’t actually using the toilet. It is not clear that hearing the sound of rain or ocean waves coming out of the bathroom would be any less freaky. And what volume would Toilet Tunes need to be to cover up the booming noise made by what comes shooting out of you? And your houseguests will be thrilled to hear a salsa beat unexpectedly going off when they have to use the facilities. 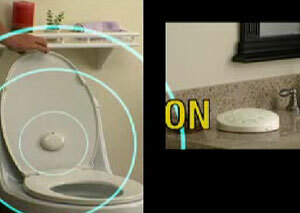 Midway through the Toilet Tunes infomercial, the rationale for the product changes from “privacy” to training your husband to put the toilet lid down. Heaven knows how annoying it is for a woman to fall into the toilet bowlespecially when her husband forgot to flush. Good thing Toilet Tunes is waterproof and washable, because we all know how bad men’s aim can be! 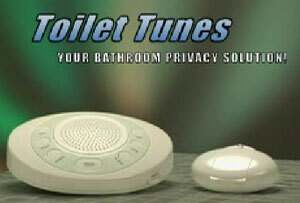 Okay, this product may not seem like much now, but just wait until Toilet Tunes 2.0 is launched. You will be able to program it to play different sounds for #1 and #2or even different songs for different consistency of stool. This info will be uploaded to the Web, stored in a cloud database, and accessible through a free iPhone or Android app. In the near future, you will be shopping in a supermarket and your smartphone will alert you that someone with diarrhea is using your upstairs toilet. Or you could just turn on a radio. How bad is it that at least one person immediately came to mind for me that would find Toilet Tunes utterly useful? I guess I just discovered what I could get my brother for Christmas! Laughing out loud at the part about the cloud database!! Also, wouldn’t the music be more effective at camouflaging bathroom sounds if it was played outside of the bathroom? “I even put one in my boyfriend’s house!” Wow lady you’re quite the catch. Er.. you are probably not going to believe this but a feature like this is actually rather common in Japan. I saw a guy using one and thought it was the strangest thing in the world. Apparently at least some Japanese don’t like the idea of other people hearing them fart or doing number 2. How could I buy this toilet tunes ? ?